As the attacker bears down on goal, the keeper’s positioned well, he’s off his line ready to close down the angle and deal with the shot. It looks like he’s done enough, the shot hits the bar and cannons off into the air. Job done, then? 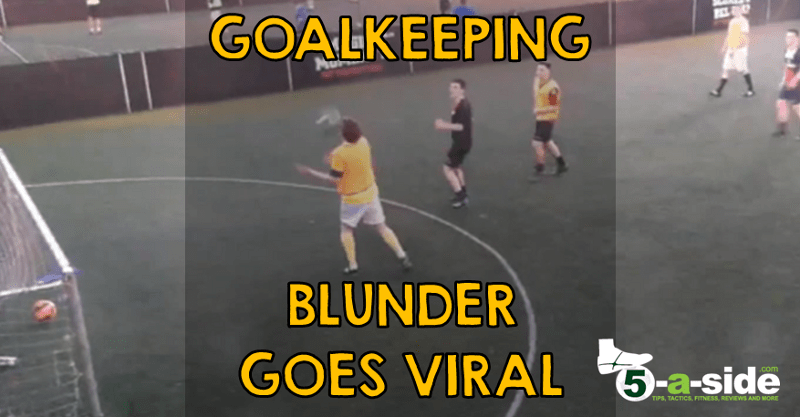 It’s probably a bit harsh to blame the keeper for that one. He did most of what was required of him and isn’t exactly his fault that the ball happened to rebound up in the air and settle down on top of his cranium, taking a wicked bounce off and into the goal. You can’t make this stuff up. What are the chances of something like this happening?! As you can imagine, it’s doing the rounds on Facebook and Twitter, where it seems everyone is celebrating the ridiculousness of the situation with glee. If you’re out there, keeper, go and claim your free Lager. If you’re a budding 5-a-side goalkeeper and want all the top tips to be a cat-like king of the pitch (this doesn’t include letting the ball bounce in off your head), then read our top 5-a-side goalkeeping tips now.